We offer you a cross-platform and cross-device compatible design which provides a unique experience for the users. Complex Applications require range of functionalities which are specific to certain requirements. We provide solutions which are tailored to your very specific needs. Managing your website content could become a hassle. We help you manage your website with convenience through building easy to use Content Management systems. Our web design and development team provides clients with bespoke or third party e-commerce systems. The solutions are integrated with payment gateways of all payment partners. Our expert team of Web developers reboot old websites and transform them into Single Page Applications which are supported by a RESTful Api. This is specially useful for distributed Web Applications which need to be easily scaled. We offer our clients cross-platform and cross-device compatible web apps which provides a unique experience to the audience. By creating a resposive website, we help our clients eliminate the hassle of creating seperate websites for mobile and desktop which saves reasonable amount of time and money. Our design process allows us to make websites which look stunning on smartphones, tablets and desktop monitors, regardless of the device screen configuration. We know how important it is to easily update a website, change it's content or even add more functionality. As a result, We help you manage your website by building a system which could be easily managed by you in a user friendly manner. Our CMS solutions range from custom Wordpress themes, powerful multi purpose Expression engine to bespoke content management systems with user friendly administration systems. Depending on the type of project and the requirements, we design and develop custom players which enable live or on-demand audio or video streaming. 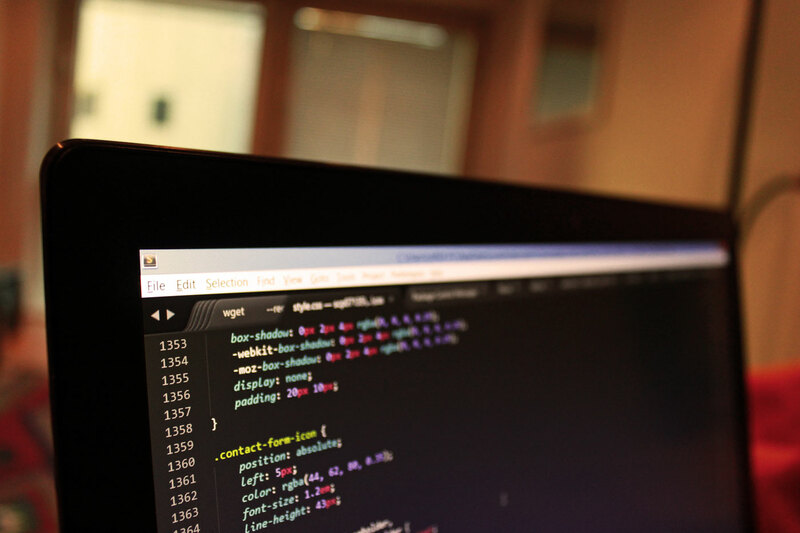 Using the HTML5 technology allows us to have full flexibility in design. The process normally involves sketching and mocking up the player design prototype and once you are satisfied with the design we build the player. In case you have a prepared design for the player, we will create the HTML markup based on that followed by building the functionality. By building outstanding e-commerce website, we offer your customers a unique shopping experience and help you increase your online customer base and generate more revenue. Our e-commerce solutions span from small online shops to multi-currency e-commerce websites. Creating an enjoyable experience for the shoppers is our initial aim. To make sure we reach that goal, we create usable websites which allow easy navigation, filtering and searching features to engage the visitors into the website and convert them into customers. This service is more appropriate for web applications which are aiming to offer a unique User experience on web similar to that of native mobile applications. E-Ardi is an innovative IT/web solutions company which offers Web UI/UX design and custom Web application development services to companies and individials. We strive the bring the best to our clients and help them grow their Business by creating outstanding applications tailored to their needs. The company was founded by Ardeshir Eshghi who is specialised in Web Design / Development, Amazon Cloud solutions and User Experience design. Our work started in 2012 and currently proudly serve number of clients in both UK and US. Innovation and integrity are our key values and we see our self as one of the best Web Design/Development agencies in UK. Our goal is to to keep ourselves up to date with the latest technologies and trends in the industry as we believe that’s what you expect from an Digital solutions company, as opposed to companies which rely on legacy technologies. You tell us what you expect from the design and we come up with innovative design ideas which takes into account the blend of aesthetics, usability to make sure it exactly meets your requirements and keeps your clients happy. We will then turn them into wire-frames and mock-ups and once you are completely happy with everything, we will build them into web pages. Depending on your specific needs, we provide you with tailored applications which are fully scalable and have all the specific features. With use of a wide range of technologies and tools, it is easy for us to choose the best solutions which are fully in line with your needs. These solutions can be easily integrated to other web services and tools to make the best use of other tools on the web. On top of all other solutions, we will also give you the necessary advise on how to achieve the best outcome from your web appearance. This includes ways on generating user traffic through using Search Engine Marketing, Search Engine Optimization, Social Media Marketing and best practices on usability and improving the user traction and conversion. By spending enough time, we will get to know more about you and your Business and requirements. Through these conversations,we will achieve our aim which is to determine your target audience and to identify the target platforms and devices with which they browse the web, user goals and your Business goals. By evaluating this information, we determine the various stakeholder's needs and what they like to achieve and turn them into user stories using the agile framework. The formulated a solution which will cover both functionality and design aspects of the product. The requirement analysis aids us to define objectives and goals which will help your business benefit from it's web appearance and to reach the right audience. The planning process also involves reviewing of existing system and issues, style and design preferences and your success metrics. This will bring us to the point where we prepare a clear project definition and scope which is aligned with all stakeholder expectations. Once we know what you expect and the plan is set out, we can safely move to the design phase. Initially, we arrange a workshop to brainstorm ideas and visualise them in form of sketches, which will be later used to create design prototypes, wireframes and finally HTML mockups. We will continue this iterative process until you are fully satisfied with the outcome. The development stage commences once the design process is finalised and the HTML markup is fully prepared to be integrated to the website. This step is concerned with building various functionality of the web application to make it work as we have planned to meet your expectations.We begin implementing the functionality based on written User Stories which we have agreed upon in the planning phase. Once, a major user story has been developed, it will be uploaded to the staging server, where it can be tested by you to make sure we are on the same page. This process will continue until all the defined set of functionality is built and approved. We will spend reasonable amount of time to perform a through test and making sure everything is working. We will allocate a dedicated testing team to try all the functionality and view the website on different browsers and devices to make sure it meets the compatibility requirements. This will be followed by our clients proceeding the tests. Based on the feedback you give us, we refine and improve the design and functionality to reach the satisfactory level. Finally, we will educate our clients on how to use the website features and manage the content. 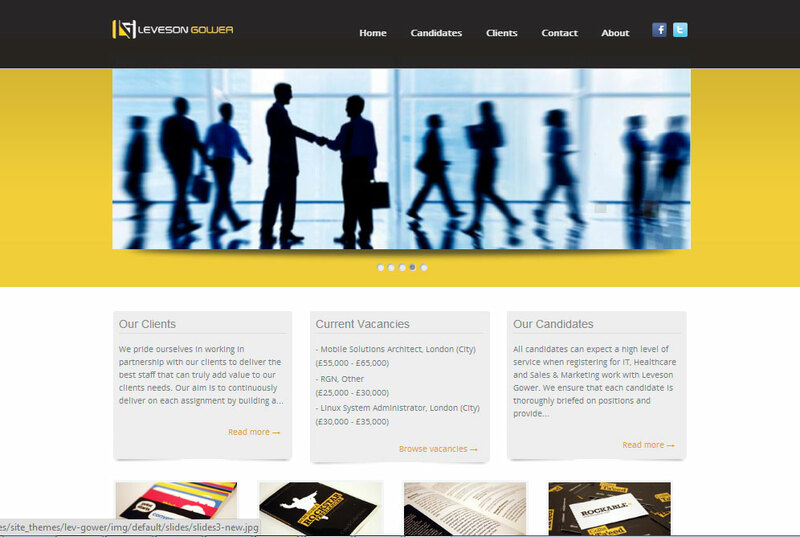 Levesongower is an IT/ Healthcare recruitment agency. The website needed to enable job search, sending CV and provide information to candidates and employers. Our approach was to use a custom Web 2.0 design combined with a powerful PHP based backend. After reviewing the project requirements we finally chose Laravel framework with the support of Backbone to create the admin system. 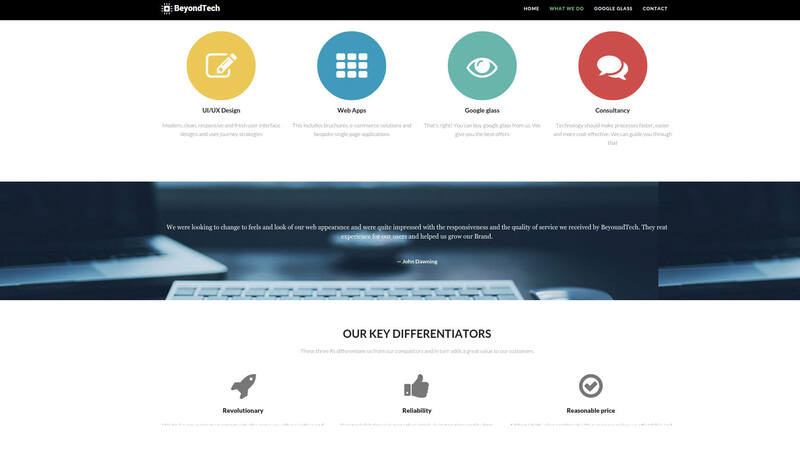 BeyondTech is an IT service company which offers design and development services to Businesses and individuals. They wanted a website to showcase their work and introduce the range of services they provide. After reviewing the project requirements we finally decided to create a single page website which gives an overview about the company and allows potential customers to communicate with the company through a simple contact form. They required the website to be mobile and tablet friendly and fully responsive all of which we managed to deliver in line with the client's demand. The project is almost finished and is currently in the testing stage. 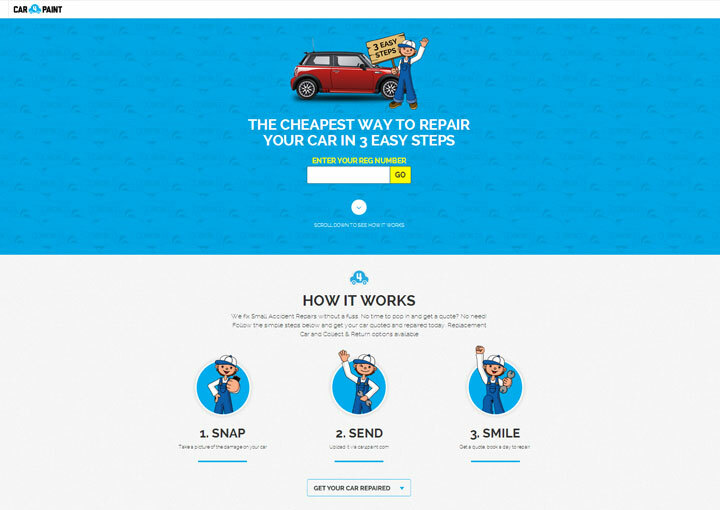 With the consent of the client, we have provided a link to test page of the website. Let's talk! We love to know more about you!